It’s easy to see looking through the archives of The Nostalgia Blog that we are all pro wrestling fans. Some of us prefer the glory-days of Hulkamania, or the Attitude era with Stone Cold Steve Austin. Myself, I enjoy everything from the 1980s to today. When I was a kid I was told by many that “wrestling was fake”. Of course being a die-hard fan I would deny, scream and usually run off crying. Still to this day I won’t admit that it’s fake. Why? Because it’s not. It’s choreographed and staged, but not fake. Wrestling is like an art form. It takes great storytelling, cheesy acting and extremely precise physicality. It’s like a macho form of ballroom dancing. They know who is going to win and how, but people get hurt. During it’s peak of popularity in the late 90’s, everyone was trying to cash in on the fame of the WWF and WCW. After the success of TV specials like Magic’s Biggest Secrets Finally Revealed, NBC aired Exposed! Pro Wrestling’s Greatest Secrets. This hour-long special was dubbed as “insulting” by true wrestling fans. It featured a series of masked wrestlers (who were protecting their identity…nice try Harley Race) going through all of the biggest “lies” you see on TV. Such as the bad guy wrestler pushing down a granny. 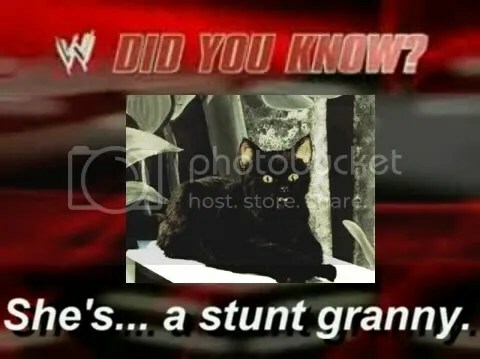 That’s right…she was a stunt granny!